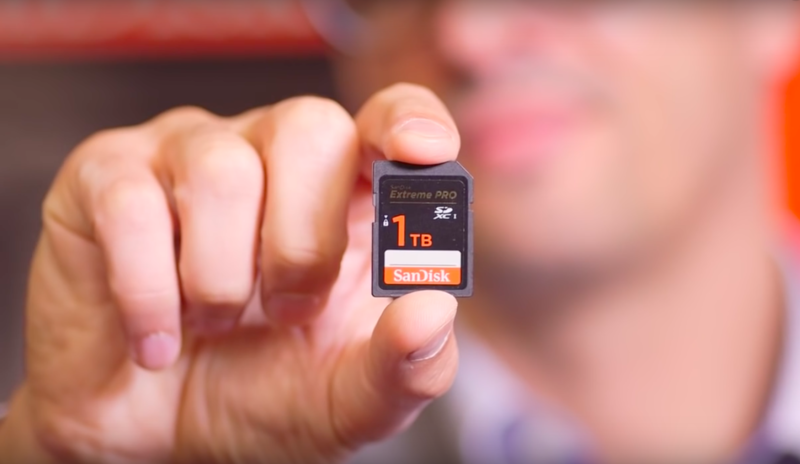 A few days ago SanDisk announced that it will be rolling out a 1 TB SD card, which would be the first time any storage device manufacturer has managed to cram so many ones and zeroes in such a small piece of hardware. We do, indeed, live in exciting times. 16 years ago it was again SanDisk that unveiled the world’s first 64 MB SD card, which may seem ridiculously tiny today but was a breakthrough in storage capacity at the time. The one-terabyte card is coming to dethrone the 512 GB one, which is currently the biggest one you can get on the market (provided that you have about $350 to spare). The new queen of SD cards is still just a prototype and while we trust that SanDisk will make it work, we’re also a tiny bit sceptical as no actual tech specs have been released yet. What is gonna be the card’s write speed? What about read speed? How much is it going to cost? Is it going to work with my (kind of) old camera? I have so many questions!!! Western Digital, SanDisk’s parent company, says the new card is geared toward emerging technologies such as ultra-high-resolution photos, 4K videos, virtual reality, 360-degree video, and video surveillance. This kind of answers the question about my old-ish camera, as it makes it obvious the 1 TB card is mostly designed for professional-level users – such as pro photographers/videographers who have a hard time juggling SD cards, external hard drives, USD flash drives, etc. I’m guessing this group must be ecstatic about the announcement. As an amateur photographer, however, I most probably won’t take advantage of the 1 TB card. Here is why. I shoot with a Canon DSLR which is old-ish. While it serves me perfectly and helps me capture wonderful moments on film (or rather, on matrix), any SD card bigger than 16 GB is a big spoon for my Canon to swallow – it struggles, gets slow saving the images on the card, and ultimately drives me crazy. The card may have a huge memory but my laptop doesn’t (I’m one of those poor souls with a 128 GB Macbook) – so even if I have more than enough space to shoot footage, I have no place to store all of it locally, and I would still need to revert to an alternative storage source. In my case, that alternative would be cloud storage but if I am already using cloud storage, why would I need an SD card that large? That’s right, I wouldn’t. SD cards get broken and/or corrupted. I suppose it is to be expected for such a small piece of hardware to be fragile, and even if you take extra good care of your cards, you still end up with one that needs to be formatted (all data on the card is lost), one that wouldn’t read what’s on it or write new files (again, all the data you already have is as good as lost) or one that needs to be glued together as it is in pieces (you guessed it – data lost!). This happens, and it happens a lot – so I would feel much better replacing a card that didn’t cost an arm and a leg. Speaking of costs… If you make a living shooting photo and video, it makes sense to spend a couple of hundreds on an SD card – after all, it is one of the tools, on which your livelihood depends. As an amateur photographer, however, I simply won’t get the value for the money – especially given my practically unlimited access to cloud storage space (one of the many, many perks of working for pCloud). Even if you are a pro, it will probably be cheaper to use cloud storage instead, let’s crunch the numbers. SanDisk has not announced the price of the new 1 TB card yet, but as I said, the 512 GB sets you back about $350. Let’s assume that the new, bigger card will cost $700. A subscription for a pCloud Premium Plus plan costs $7.99/month and gives you not one, but two terabytes of space. That’s $95.88 a year, which means that you can either get an SD card with 1 TB of storage, or get a Premium Plus plan with twice the storage space for 7+ years while using the smaller SD cards you already have. And let’s be honest – one terabyte will probably not be an impressive capacity at all in 7 years, so I think pCloud is a clear winner here. To top this up, pCloud and cloud storage in general allows me to share the footage I shoot much easier and much faster, which is an added value not only for amateurs but also for professionals who need to send the product of their work to clients. Don’t get me wrong, I am not saying that a 1 TB SD card is a useless thing; if anything, it is a wonderful testament of how far we have come, technology-wise. I am also absolutely positive that many a professional photo- and video content producers will make a great use of it. The thing is, though, that there are alternatives that may prove to be better and more cost-efficient for many people – and yes, pCloud is definitely one of them.